Abdominal organ transplantation is a complex, multi-step process that requires flawless surgery from start to finish. Training in organ retrieval and bench surgery, however, has varied from country to country and even center to center, and trainees too often must rely on hands-on experience without the benefit of extensive practical or theoretical training. With the number of transplant programs on the rise and the demand for donor organs increasing steadily as outcomes continue to improve, there is a greater need than ever before for a practical and comprehensive reference that transplantation professionals can turn to for clear and comprehensive guidance. Abdominal Organ Retrieval and Transplantation Bench Surgery fills that need. 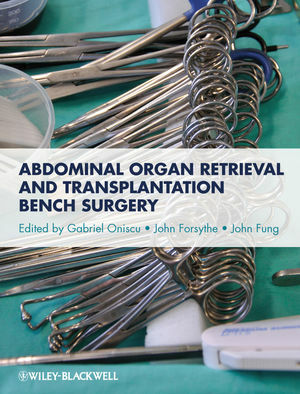 Abdominal Organ Retrieval and Transplantation Bench Surgery is the ideal guide for surgeons and donor retrieval teams alike. With its step-wise approach and practical orientation, it is a reference transplant professionals can trust to help them understand and excel at all aspects of abdominal organ retrieval, from managing potential donors and properly retrieving organs to minimizing the likelihood of common pitfalls while mastering the latest surgical techniques.